AT&T Office@Hand Skype for Business app allows you to make and receive Office@Hand calls, send and receive SMS texts, initiate Office@Hand online meetings and audio conferences. Follow the steps below to learn more about sending and receiving messages on the Office@Hand app for Skype for Business. 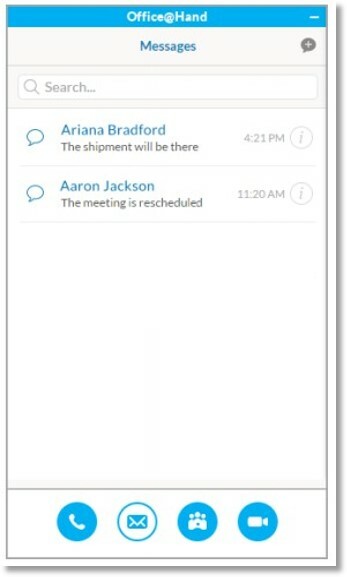 When you select the SMS tab in the AT&T Office@Hand for Skype for Business app, you will see the conversations, with new messages highlighted in blue. 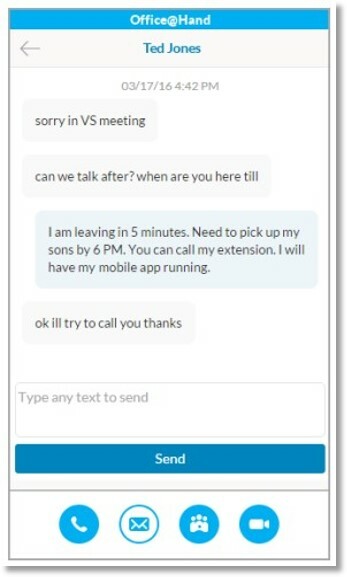 You can access this feature either from the mini app SMS tab directly, or from the SMS with Office@Hand option from the Skype for Business contact menu. You need to select a From number and a To number and input text to send. Each message can have a maximum length of 1,000 characters. After the message is sent, you will see the Conversation page. You can view all conversations they have via the Back icon on the Conversation page. 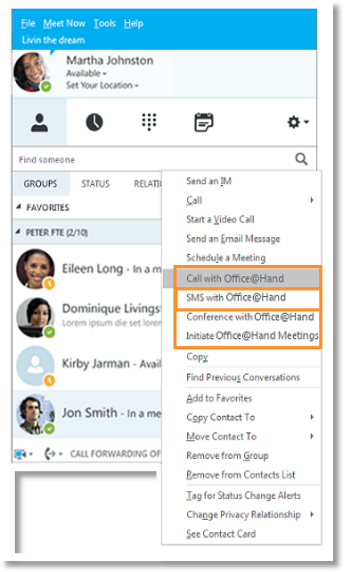 If you right-click on a Skype for Business contact and select SMS with Office@Hand, the contact’s phone numbers saved in Office@Hand and Skype for Business will be populated in the drop-down below the To field in the Office@Hand for Skype for Business app. Note: If you have no access to SMS service, the app will prompt you: SMS is not supported for your Office@Hand number. Please contact your account administrator for an upgrade.